This is where 3rd street goes under the freeway and hits Mandela parkway. There is garbage EVERYWHERE. you'll need a big truck. The City of Oakland Public Works Agency has received this issue. It is registered as service request # 425350. Please check back for status updates or contact us directly at (510) 615-5566. City of Oakland Public Works Agency addressed this issue on 09/19/2012, service request # 425350. You're kidding right? This is the second time you've said that the job was done. You can see the garbage from a block away, maybe farther. The City of Oakland Public Works Agency has received this issue. It is registered as service request # 447011. Please check back for status updates or contact us directly at (510) 615-5566. The City of Oakland Public Works Agency has received this issue. It is registered as service request # 418988. Thank you, in advance, for your patience as we work through a backlog of pothole service requests. Unfortunately the City does not have enough funding to repave all streets in poor condition. With limited funding, our response to resurfacing requests is limited to minor pavement and pothole repairs only. Our Street Maintenance Department will assess your street and determine whether temporary measures might be appropriate. Please understand that this work may be limited to pothole or other minor repairs, and that we have many similar requests. We will do our best to respond in a timely manner. The backlog of streets in Oakland needing pavement currently is $435 million and growing. The City of Oakland Public Works Agency has received this issue. It is registered as service request # 418888. Please check back for status updates or contact us directly at (510) 615-5566. The City of Oakland Public Works Agency has received this issue. It is registered as service request # 402553. Please check back for status updates or contact us directly at (510) 615-5566. Street flooding. There's no drain, so you'll need some heavy mops to move the water. The City of Oakland Public Works Agency has received this issue. It is registered as service request # 436084. Please check back for status updates or contact us directly at (510) 615-5566. Homeless are not only setting up camp for weeks at a time, they are running a car wash out of the 1035 7th Street Business by stealing water during the middle of the day and also late at night. They are also dumping an enormous amount of trash outside the gate to the rear of the 1035 7th Street warehouse. The photo uploaded is of the guy washing the cars and stealing our water. He wouldn't stop and just kept walking over to our business and filling up at our spigot. Very aggressive. The camp and trash must be hauled off and closed down. The City of Oakland Public Works Agency has received this issue. It is registered as service request # 422574. Please check back for status updates or contact us directly at (510) 615-5566. 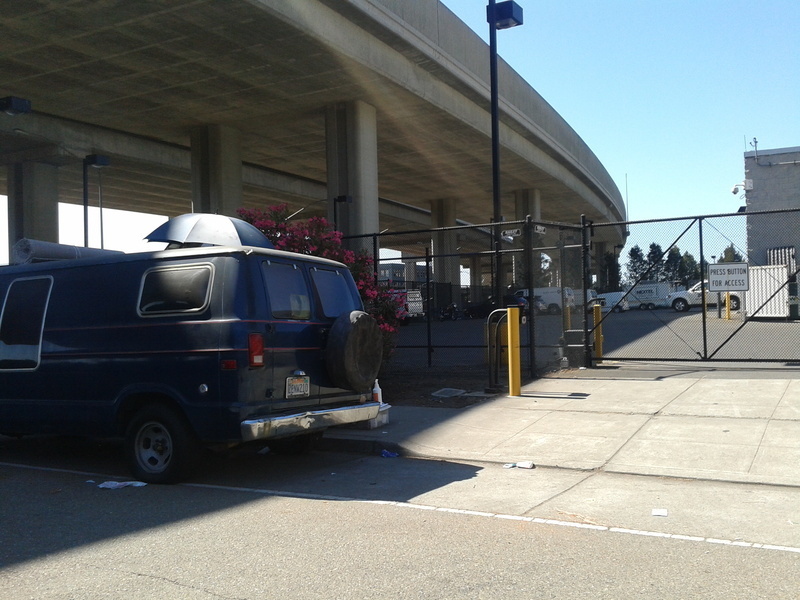 City of Oakland Public Works Agency addressed this issue on 08/30/2012, service request # 422574. The camp remains completely intact. While there are posted signs, the amount of trash & belongings are still very much onsite and active (at night). Please address and completely remove trash so people discontinue use of this corner. The camp is growing each day. There is now a van parked outside, illegally (has expired Registration too), not parked on a proper parrking space and hasn't been moved in over a week. They are literally taking over the entire sidewalk and making a HUGE mess of the entire corner. I see them running from the van to the low income housing complex across the street each day. They also continue to steal our water from our spigot on 7th Street. There are posted signs of personal belongings removal but nothing beyond that. If anything, the problem has just gotten worse. Please help! Huge Mongus!!!!! Pothole that has caused property damage to tires and causes drivers to swerve away. This is a hazard. The City of Oakland Public Works Agency has received this issue. It is registered as service request # 429150. Thank you, in advance, for your patience as we work through a backlog of pothole service requests. Unfortunately the City does not have enough funding to repave all streets in poor condition. With limited funding, our response to resurfacing requests is limited to minor pavement and pothole repairs only. Our Street Maintenance Department will assess your street and determine whether temporary measures might be appropriate. Please understand that this work may be limited to pothole or other minor repairs, and that we have many similar requests. We will do our best to respond in a timely manner. The backlog of streets in Oakland needing pavement currently is $435 million and growing. The City of Oakland Public Works Agency has received this issue. It is registered as service request # 423301. Please check back for status updates or contact us directly at (510) 615-5566. City of Oakland Public Works Agency referred this issue to CODE ENFORCEMENT, service request # 423301. Please contact that agency to follow-up. For more information, please visit the "Helpful Links to Other Resource Partners" at the link below. Paving job never finished. Several manholes surrounded by wide, deep gaps. The City of Oakland Public Works Agency has received this issue. It is registered as service request # 398586. Currently, we are working on this issue. Please check back for status updates or contact us directly at (510) 615-5566. Thank you for you request, butdditional information will be needed to process your request. When did the repaving job take place? Do you know who the contractor was?. We will need a detail description of the problem you are reporting. If you would like to, you can contact the Public Works Agency at (510) 615-5566 and speak with one of our Public Service Representatives. Your assistance in this matter is greatly appreciated.